Baileys Retreat in Bardney, near Lincoln, Lincolnshire sleeps 6 people. 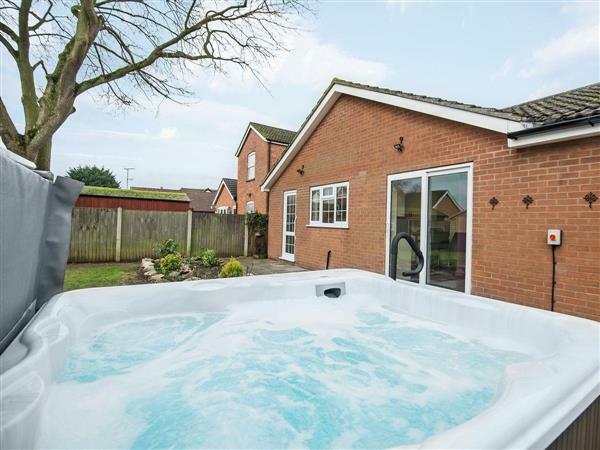 Bailey’s Retreat near Lincoln is a detached, single-storey property on the outskirts of Lincoln, situated in the village of Bardney. Bailey’s Retreat near Lincoln has three spacious bedrooms, a cosy living room, a well-equipped kitchen/dining room and even boasts a private hot tub to enjoy after a day spent exploring the local area. There is so much to see and do in the surrounding area, from sightseeing in Lincoln with its cathedral and castle, to enjoying a lovely meal at one of the many cafés and restaurants. This delightful holiday property sits on Viking Way cycle route, with cycle hire available nearby. The Lincolnshire Wolds offers many country pubs and quiet villages such as Louth, and is only a short drive away from Market Rasen Racecourse. The traditional seaside resort and beach at Skegness is less than an hours’ drive, and offers a lovely day out for all the family. The shop, pub and restaurant are all ½ mile from Bailey’s Retreat near Lincoln. Bailey’s Retreat is all on the ground floor. Gas central heating, gas, electricity, bed linen, towels and Wi-Fi included. Travel cot and highchair available on request. Welcome pack. Enclosed lawned garden with patio and garden furniture. Hot tub for 6 (private). Bike store. Private parking for 3 cars. No smoking. Holidays at Baileys Retreat run from Friday to Friday. Pets allowed at Baileys Retreat. For a better idea of where Baileys Retreat is, you can see Baileys Retreat on the map below. Baileys Retreat is in Lincolnshire; should you be on the lookout for a special offer, you can find all the special offers in Lincolnshire. It's always worth checking to see what is on offer at the moment. Do you want to holiday near Baileys Retreat (UKC1585), you can see other cottages within 25 miles of Baileys Retreat; have a look to find your perfect holiday location.